Show off your purple pride! Submit a photo of yourself, your family or your pet here. As long as they’re displaying Truman spirit, you could get some free Truman prizes! Several Truman alumni will be recognized at the Alumni and Friends/Hall of Fame Banquet at 6 p.m. Oct. 10 as part of the Homecoming 2014 celebration. Each week the Truman Today will profile different award honorees. This week looks at the Distinguished Service Award. Born and raised in Blue Springs, Mo., Cindy Spiker graduated from Truman in 1993 with a Bachelor of Science degree in mathematics. She went on to earn a Master of Science degree in statistics from the University of Idaho in 1995 and previously taught statistics at Drake University. Spiker currently lives in Des Moines, Iowa, and works as a senior database marketing manager for Meredith Corporation, which publishes 14 subscription magazines. Her department analyzes data to market to consumers in both print, online and mobile/tablet environments. 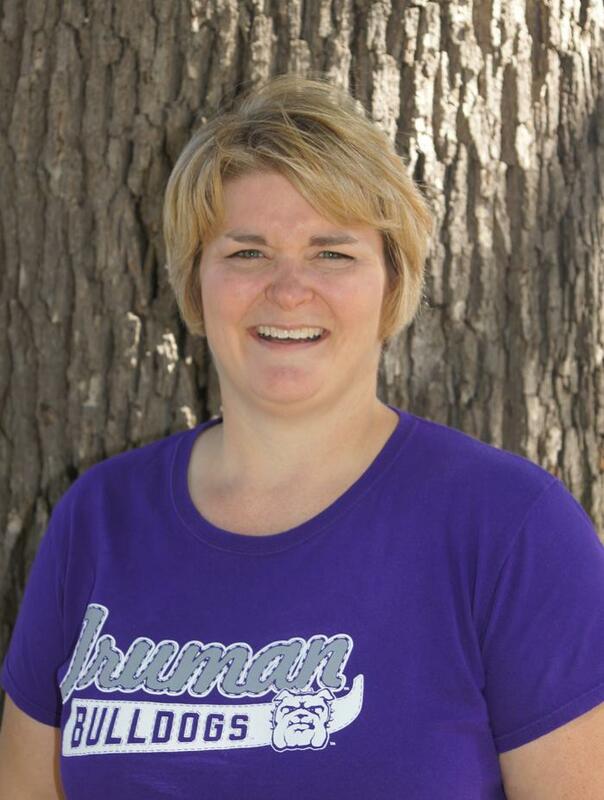 Spiker serves as president of Truman’s Iowa Alumni Chapter, is a past member of the Truman Alumni Board of Directors and she co-chaired the Iowa Regional Committee for the University’s “Bright Minds Bright Futures” Campaign from 2006-2011. In 2005, she was honored as Truman’s Young Alumna of the Year at Homecoming. Spiker is also a member of the John R. Kirk Society and the Joseph Baldwin Society and recently served on the Truman Foundation Board of Directors. Spiker first got involved with the Iowa Alumni Chapter to meet new people in a new town, then her engagement as a volunteer evolved into giving back to an institution that has given so much to her. She still keeps in touch with many professors and staff members from her college years, and she formed many lifelong friendships during her time at Truman. Outside of Truman, Spiker is a ministry deacon and confirmation mentor for Meredith Drive Reformed Church and is active with the Iowa State Fair Blue Ribbon Foundation, the fundraising arm of the Iowa State Fair. In her spare time, she enjoys watching Major League Baseball games, gardening, hiking, camping, traveling and bicycling. 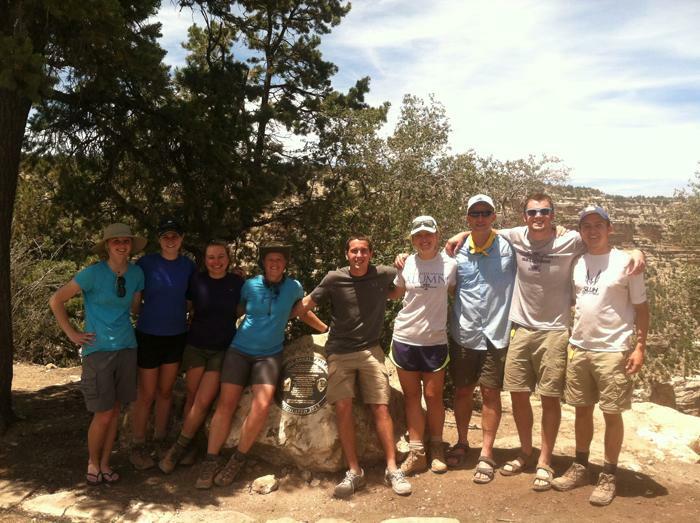 Truman has been a family tradition for Spiker and many of her family members. Her father Rick Spiker is a 1965 Truman graduate and brother Tony is a 2002 graduate, along with several other aunts, uncles and cousins. 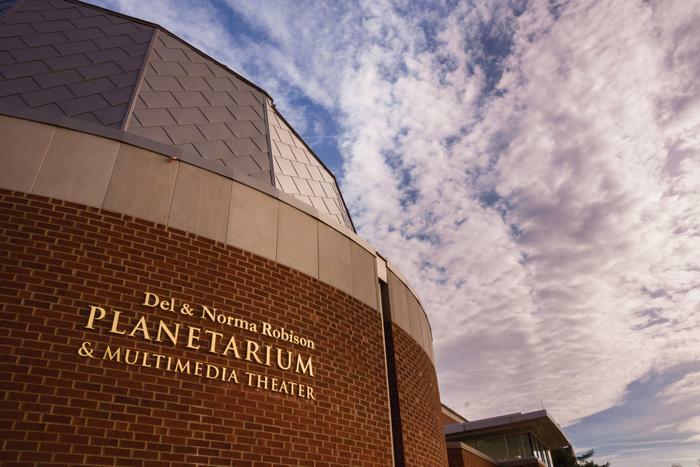 The 60-seat, 1,800 square foot Planetarium and Multimedia Theater project started in 2005 with the expansion and renovation of Magruder Hall. With the help of private donations from alumni, parents and friends of the University, the Planetarium is now the only such facility in nearly a 100-miles radius of Kirksville. Saïd Sayrafiezadeh, New Yorker writer and author of the memoir “When Skateboards Will be Free,” will be giving a reading at 7:30 p.m. Sept. 30 in the University Art Gallery as part of the Clayton B. Ofstad Readings Series. Sayrafiezadeh is the author of the short story collection “Brief Encounters with the Enemy,” which is currently a finalist for PEN/Robert W. Bingham Fiction Prize. He also received a Whiting Writers' Award for his critically-acclaimed memoir “When Skateboards Will Be Free.” The memoir, which recounts his childhood as the son of an Iranian father and a Jewish-American mother, was selected as one of the 10 best books of the year by Dwight Garner of The New York Times. His short stories and personal essays have appeared in The New Yorker, The Paris Review, Granta, McSweeney’s and The New York Times. He was the recipient of a fellowship from the Cullman Center for Scholars and Writers at the New York Public Library and teaches at Hunter College and NYU. Through the collaboration of Pickler Memorial Library and the Missouri and Southern Iowa Art Guild (MOSI), people can now enjoy a new art display in Jazzman’s café on the first floor of the library. Thirteen self-selected artists from the MOSI Art Guild volunteered to contribute various styles of artwork, including multimedia abstracts, watercolor, oil paintings, fiber art and woodturning. Pieces range from realistic to mystical subject matters. The exhibit, which spans the entire café seating area, will be on display until Dec. 13. The exhibit began as a small idea. Richard Coughlin, dean of libraries and museums, was interested in providing artwork for the studious atmosphere. Amanda Langendoerfer, head of special collections and archives, then reached out to Colleen Wagner, president of the MOSI Art Guild, to make the thought become a reality. Students, faculty, staff and other community members have the opportunity to vote on their favorite art piece until 3 p.m. Oct. 2. The artist with the most votes will be rewarded the Viewer’s Choice Award and recognized during a reception at 5:30 p.m. Oct. 2 in the library café. The reception is open to the public. Refreshments will be provided. The MOSI Art Guild invites all interested individuals and Truman students to become a member. The guild provides numerous activities for members to stay involved in the community, such as the “Artist of the Month” and at least two yearly art shows. The next meeting will take place at 5 p.m. Oct. 9 in the Kirksville Arts Center. For more information, contact Richard Coughlin, dean of libraries and museums, at coughlin@truman.edu or Colleen Wagner, president of MOSI Art Guild, at colleenkw43@gmail.com. 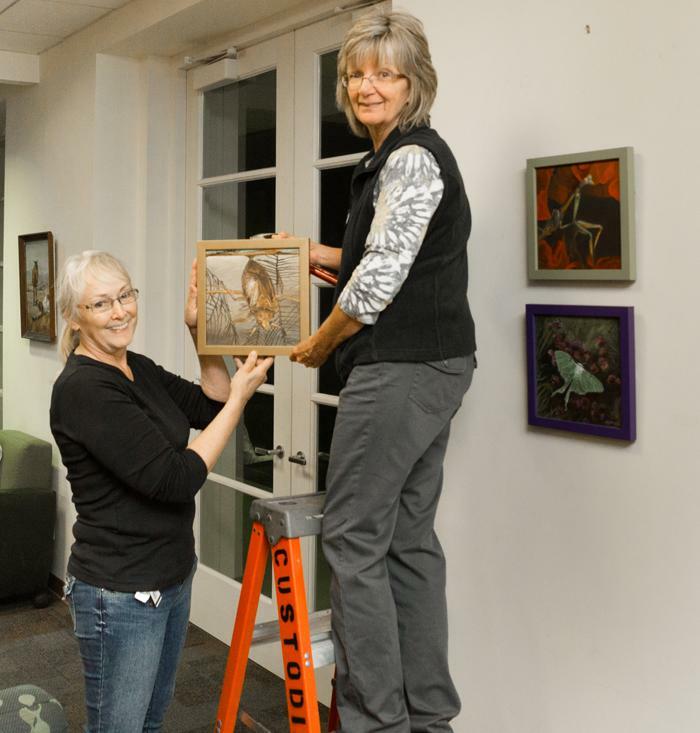 Colleen Wagner, left, and Amber Corbett install new artwork in Pickler Memorial Library. Truman’s Forensic Union, speech and debate team, opened this season with notable success, securing the debate sweepstakes championship and earning four early-season qualifications for the National Forensic Association championships in April. Sweepstakes is an overall tally of the performance of individual universities in debate competition, compiling the performances of all a school’s competitors. Truman’s finish placed them ahead of regional competitors such as Illinois State and Hillsdale College, and against more far-removed contenders such as Lafayette College and the University of Kentucky. Donny Richardson, a sophomore history major, began the weekend by reaching the final round of the second annual Western Kentucky Round Robin, an invitation-based tournament in Lincoln-Douglas debate. During the open portion of the weekend, the Western Kentucky “Forensic Fiesta,” Kelsey Barnes, freshman political science and history major, and Connor Stewart, freshman business administration major, closed-out the final round of novice Lincoln-Douglas debate, sharing the tournament championship. Elias Garcia, freshman economics and computer science major, reached the semifinals of the novice division, after meeting teammate Barnes in the semifinal bracket. Barnes was also ranked top speaker in the novice division. In the open division of Lincoln-Douglas debate, Max Highsmith, senior math and computer science major, reached the quarterfinals while Mackenzie Barnes, junior political science major, reached the octafinal round. Richardson was ranked third speaker in the division. The team travels next to Bradley University and Illinois State University for the “74 Swing” Oct. 4-5. Participation in the forensics program is open to any student in good standing, regardless of prior speech and debate experience. For more information, visit forensics.truman.edu or contact Christopher Outzen, director of individual events, at coutzen@truman.edu, or Kevin Minch, interim director of forensics, at kminch@truman.edu. Alpha Phi Omega is sponsoring a “Glow in the Dark” dodgeball tournament benefiting Campfire USA. Participants will play under black lights and are encouraged to wear white or neon clothing that will glow under the lights. Registration is now open and participants can fill out forms online or at registration tables from Sept 29 until Oct. 3. The cost to participate is $25 per team or $5 per person and each team must include at least two girls. The tournament will take place at 5 p.m. Oct. 4 in the Pershing Small Gym. Or sign up tables will be available from 10 a.m.- 4 p.m. Sept. 29-Oct. 3. Truman’s Theatre Department will perform “Eurydice” at 8 p.m. Oct. 1-4. Tickets cost $3. The Boeing Company will be on campus Sept. 29 for several workshops focused on career opportunities. An Overview and Q&A Panel will take place at 8:30 a.m. and 10:30 a.m. in Violette Hall 1000. After these sessions, a Resume and Interview Skills Workshop will take place at 12:30 p.m. and 2:30 p.m. in Violette Hall 1000. For those interested, stop by the information table in Violette Hall lobby throughout the day Sept. 29. Students thinking about going to graduate school should consider applying to the McNair Program. Learn more about this valuable resource and the eligibility requirements at two McNair information meetings at 12:30 p.m. Sept. 29 in Magruder 2000 (STEM majors) and 3 p.m. Sept. 29 in Violette Hall 1140 (all majors). Applications to the program are accepted Oct. 1-Nov. 1 at mcnair.truman.edu. The University Conduct Board hears cased of alleged misconduct to determine whether a student or student organization’s behavior violates the Student Conduct Code, and if a violation is found, the imposition of sanctions. 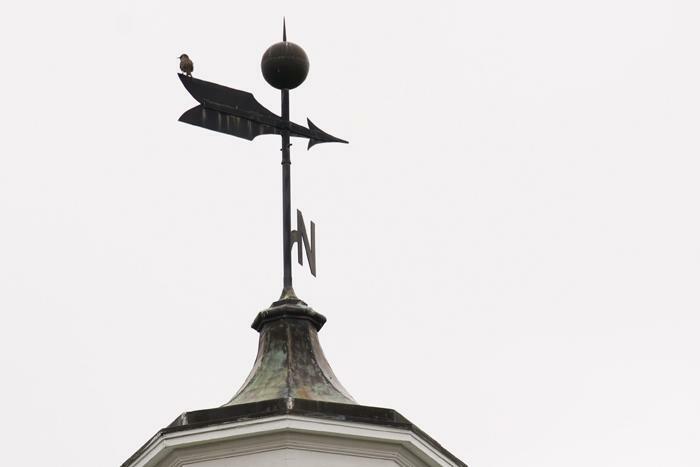 Additionally, the University Conduct Boards seeks ways in which to connect the qualities of citizenship with the values of Truman State University. New Faculty Seminar – Making Use of Lecture Capture? Betty L. McLane-Iles, professor of French, completed a new student edition in “French of the Mémoires of Madame Roland,” a major figure of the French Revolution of 1789. It will be published in 2015 by Lingua Texts, European Masterpieces/Molière & Co.
Professional Photos: University photographer, Tim Barcus, will be taking professional photos. Interested in studying abroad in Austria? It just became more affordable with the Dr. Ina Stegen Scholarship, designed to support students’ dreams of studying at Salzburg College. The deadline to apply for this $2,000 scholarship for the Spring 2015 semester is Oct. 1. For more information, visit the website.